My husband and I recently moved into our first home which came with an above ground pool. Neither of us are 'pool people' and feel a little out of our comfort zone. My biggest concern is that the pool is on a slant, tilting towards the house. The liner is very wrinkled, and when we had the pool opened this year, were told there were no immediate dangers, but it would be a good idea to level the pool when we decided to replace the liner. Based on how shotty many other components of the house have turned out to be, I am scared the pool wall will fail and lots (21 foot round pool) of water will come rushing into the house. Am I being paranoid, or should we just drain it until we can afford to either fix it or get rid of it all together? There is a few inches difference in water level because of the slope. Hi Janice. There are several factors to consider with regards to how far off level an above ground pool can be, and still be safe. The most important is how much soil is packed around the outside of the pool to support it. A pool can be six inches or more off level if it is sunk two feet into the ground. The dirt around the outside of the pool prevents any type of pool failure. A pool flat on the ground, with no dirt packed around the outside, should not be more than an inch or two off level. The type of pool makes a difference also. A pool with six to eight inch uprights and top rails will be a lot more secure than one with two inch rails. The better the pool is constructed the more out of level it can be and still be safe. How well the pool was constructed is another factor. If the pool is not round, and if the rails are not all sitting firmly on solid soil, you may have problems. A round pool with a very gradual even slope can fair much better than one that is not round and up and down all over the place. You have to use your best judgment on this but since you feel the liner needs to be replaced anyway, probably the sooner you make repairs the better. Just remember to level with a laser level and stretch the new liner into place to prevent wrinkles. I have an oval Esther Williams pool. The left side of the pool is in ground to about 4 inches from the top. The rest of the pool is packed with dirt about 6 inches from ground. We had issues with the town and did not pack the dirt immediately around the pool, waited about 2 months. A section of the pool settled incorrectly. It buckles in slightly, but it is very apparent on the pool fence on top. Is this our fault or the installers? Do I need to fix it? How do I get it fixed? Will the pool collapse with no water in it? Hi Jackie. If the pool settled on the side where you packed the dirt up 6 inches and you had told the installers you would take care of that it might be your fault. If there was no such agreement it is probably the installers fault. I would sure have them look at it. In most cases it takes the ground around the outside of the pool at least a year to pack good enough for you to drain the pool without it collapsing. If the damage is minimal and not dangerous to the pool I would let it go. I could tell better with photos or your installers may be able to advise you. Pages related to Pool Leveling. I installed this 28' above ground pool myself and I didn't take the necessary time, or precautions, to make sure the area for the walls was completely level. Now it is full and off by about 4 inches from one side to the other. Can I get by with this for the next two summer months and re-level over the winter, or should I be more concerned, and take the steps of draining and fixing it now? Hi Greg. In most cases you will be just fine, but it is impossible for me to say for sure. There are many variables that come into play. The quality of the pool is one, the better the pool the better the chances of it being OK. If you have dirt packed around the outside of the pool you are better off. A pool set in the ground a foot or so, and back filled with dirt, could be six inches or more off level and never collapse. A visual inspection of the bottom rail is another good indicator. There should be no gaps under the rail. The rail should not be pushing up as to cause the wall to buckle. With a very gradual slope, from one side to the other, the bottom rail should not show signs of stress or of being out of whack. Check the top rails also. If the slope is uniform the rails should not show signs of being up and down, or in and out. You need to visually asses the pool for soundness in order to determine if it can stand for two months without a problem. When you do decide to fix the leveling problem be careful not to completely drain the pool, unless you absolutely have to. Resetting a used liner can be a real pain. The liner will shrink and cause problems with re-installing. I would use the method described on this page, if possible. I recently installed a 24' x 48" above ground pool in my backyard. We got a little rushed and after all is said and done the pool is 2" low on one side. It's not a sudden drop - it gradually goes down then back up across 5 or 6 support posts. I did have the yard leveled by a contractor and leveled my bottom rails myself. Not sure where it went wrong but it's wrong nonetheless. Is 2" acceptable or do I need to drain the pool and get it level? My gut tells me it's safe and the level, or lack of, is more cosmetic than anything. Should I drain it and level it or should it be okay? Hi Kevin. In most cases 2" out of level is not going to cause you any problems. There are many factors involved in how an out of level pool might affect you, or how safe it is. A pool that is a foot in the ground, and packed in with dirt, can be out of level by six inches or more and be just fine. With all that dirt holding the base solid the pool is not going anywhere. Dirt packed in around your pool adds a great deal of support to it. If you have a good solid cove on the inside of the pool you are probably just fine. You can also visually check all of your bottom rails for any that are not resting firmly on the ground. It's even better if the bottom rail is covered on the outside. You can also monitor this situation. Make sure the pool is not sinking more over time. If the situation gradually gets worse it is probably time to drain the pool and make a repair. Fixing the level is not hard to do, but you would need to drain the pool. If this is something you want to try, be sure to not drain the pool all the way. 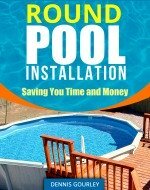 This page talks more about leveling an existing pool. Best Way To Re-level Pool? Our pool has sunk on one side, almost 4" lower than the rest of the pool. What is the best way to fix it? The original installers did not put patio stones under the posts, and when the neighbor landscaped his yard, our yard got too much water. The ground underneath is clay and we are also fixing the drainage for the yard. Do we lower everything the full height? Do we meet in the middle - lower half and raise half? How solid are the rails - can we carefully jack them up a couple of inches without removing the wall (there is no room to store it), or undermine a patio stones width at the post? (The pool has been drained and most of the liner removed. The pool is 17 years old or more, and aluminum, not resin. Hi Ann. Pools can always be brought back to level. If you raise the low side I would recommend using blocks under the posts. This is a big help to make sure it does not settle again. Be sure the dirt under the rails is solid also. You can use a round point shovel to raise the wall enough to work under. Just stick the point under the rail near an upright and lean back on the shovel. Done carefully this will not damage the pool in anyway. You just need a few inches under the rail and posts to work. Leveling the outside frame is the easy part. You now need to take your time and get the inside area as level as possible. I find it much easier to raise the low areas rather than lower the high side. Having the base inside the pool level when you reinstall the liner is important. You need to do what ever makes the most sense with this in mind. Make sure the cove is all rebuilt and is high enough on the wall. I just installed a new 18’ diameter 48” deep pool in my back yard. It is a hard wall pool, can’t remember the brand but it was bought brand new this year. I dug out the ground and installed about 1 1/2 inches of sand of what I thought was level. Used a 16 foot board and a carpenters level to check 360 degrees around and it was all level to start with...or so I thought. We also leveled the patio blocks to each other for the legs to sit on. Now that we are filling it. There is a 3 inch difference in water height from the house side to the skimmer side. Should I be worried this year with it or at all or should it be taken back down and redone again?? Hi Eddie My advice is do not fill a pool that is not level. Take it down and re-level the patio blocks. Spend a few dollars and rent a laser level. Level each block perfect. At that point you may need to level the area inside the bottom rails.